Danny Cipriani (/sɪpriˈɑːni/; born 2 November 1987) is an English rugby union player who currently plays for Premiership team Gloucester. He plays fly-half and fullback. He has played for the Melbourne Rebels, Sale Sharks, Wasps, and the England national team. Since starting in the Wasps academy in 2003, Cipriani has been capped for England 16 times. Cipriani went to the Wimbledon College prep school in London, Donhead. Spotted as a rugby talent at Donhead, he was offered a full scholarship and he was then advised to move to the Junior House of The Oratory School near Reading in order for him to continue his development. He later moved to Whitgift School in Croydon after Common Entrance. A keen all-round sportsman, Cipriani played junior football for Queens Park Rangers and was offered youth terms by Reading. He also played schoolboy cricket for Berkshire and Oxfordshire. He was invited to join Surrey County Cricket Club as a batsman. He also played squash at county level. He first played club rugby at Rosslyn Park in Roehampton, where he developed his passion for the game. Cipriani joined Wasps Academy in 2003 and made his debut against Bristol aged 17 in December 2004 in the Powergen Cup. Cipriani joined the Wasps Academy full-time in the 2006–07 season. He initially played for Wasps under-21 team and Wasps A team before making more regular appearances for the first team in 2007. He started as Wasps won the 2007 Heineken Cup Final. After Alex King left Wasps in the summer of 2007, the fly-half position at the club became vacant, and, after playing in a series of positions for Wasps in the early games of the 2007–08 season Cipriani played two games in an at fly-half, against Gloucester and Munster, Wasps winning both. He is quicker over 69 metres than Paul Sackey and this story was confirmed by their sprinting coach. On 6 October 2008 Cipriani was involved in a bust-up with club and international teammate Josh Lewsey in a training ground fight. Cipriani was left nursing a bloody nose and cut lip following the incident at Wasps' training ground. The spat started after Lewsey accused Cipriani of missing several tackles during a full-contact session. On 18 May 2008, Cipriani suffered a fracture dislocation of his right ankle during Wasps semi-final play-off victory over Bath. Cipriani was tackled by Olly Barkley and got trapped at the bottom of a ruck in the 49th minute at Adams Park. He was ruled out of England's tour of New Zealand due to his ankle fracture. Cipriani made his return to Wasps in a Premiership match against Bath on 1 October 2008. His recovery has been described as remarkable, given the severity of the injury, and because his return was six weeks to two months ahead of schedule. His sprint coach Margot Wells has been quoted as saying that due to Cipriani's superb attitude and hard work, he will return 'stronger in the tackle, fitter and faster than before'. Following an injury to Jonny Wilkinson, Cipriani regained the England number 10 shirt for the 2008 Autumn Internationals. He was then dropped following two poor displays in defeat to South Africa and Australia. Much was also made of his high-profile relationship with model Kelly Brook and concerns were raised by critics about whether he was fully committed to rugby. Cipriani enjoyed a good start to the 2009–10 season with Wasps, only to injure himself in a match against Northampton Saints, a match in which he incidentally scored his first try of the season. This injury ruled him out of the Autumn Internationals for England. It would be two months before he made his comeback playing in a Wasps A game against Harlequins, 7 December, playing for 40 minutes. Cipriani played his last home match for London Wasps on 1 May 2010 against Cardiff Blues in the Amlin Challenge Cup semi-final. In February 2010, the Wasps announced Cipriani would join the Melbourne Rebels. Rebels' Coach Rod Macqueen said, "Danny Cipriani is ... coming for all the right reasons. [He] is on the right path to the culture we are after." In England, there was speculation about Cipriani's chances of English selection for the 2011 Rugby World Cup. While England's manager Martin Johnson said he would not select Cipriani if he moved to the southern hemisphere, former English international Austin Healey said he believed Cipriani could still feature for England at the tournament in New Zealand. In August 2010 Neil Warnock, manager of the London-based football club Queens Park Rangers, revealed Cipriani would train with the Rangers and might even play for the reserves in preparation for his move to Melbourne. Cipriani also trained with London football club Tottenham Hotspur. In September 2010, Cipriani went to Denver to train with the Colorado Rapids, which he said was for "altitude training". During September 2010 Cipriani trained with the Milton Keynes Dons and was reportedly offered the chance to sign with them if he did not enjoy his first season in Melbourne. Despite issues with his Australian work visa, Cipriani joined the Rebels for pre-season training in late 2010. He trained at fly-half, and in early 2011 was one of two captains to lead the Rebels in two friendly trials against the visiting Tongans. Cipriani is the first England international player to join an Australian rugby club who are playing in Super Rugby. As of 23 November 2011, he has played 12 matches for the Melbourne Rebels and scored 108 points. His ill-discipline off the field has cost him the chance to play more. In the Rebels second ever game in the Super Rugby competition against the Brumbies, Cipriani scored the Rebels's first points from a penalty kick. He then went on to score another 17 points in the game and help the Rebels to their first ever win. Cipriani's off-field behaviour has caused him problems with the Rebels. After the first match of the season, a loss to the NSW Waratahs, he was accused of taking a bottle of vodka from behind a Melbourne bar. The club fined him his match payment. In May he and teammate Richard Kingi were stood down for the game against the Queensland Reds, after failing to meet standards agreed by the Rebel players' group. He was then left out of the Rebels squad named to tour to South Africa for two matches. In the 2011 season he was criticised for his poor defence. Cipriani signed a new three-year contract with Sale Sharks to join them at the beginning of the 2013–14 season. He has scored over 200 points, including four tries in the first four games of the 2012–13 LV= Cup, making him the second highest points scorer behind Harlequins' Ben Botica, in this year he also helped Sale reach the LV= Cup Final, has scored a sensational try against Scarlets and, up to this point, been an integral part of Sale Sharks survival bid in this seasons Aviva Premiership. In May 2014 Cipriani was selected for England's 30-man squad for the three-match tour to New Zealand in June. In February 2016 it was announced that Cipriani would rejoin the Wasps for the 2016–17 season. After two seasons with Wasps, Cipriani joined Gloucester Rugby for the 2018-19 season. Cipriani captained the England under-16 team. He played fly-half for the England under-19 side in the Under-19 World Cup but was unable to complete the tournament due to a head injury. Cipriani was part of the Saxons' side that won the Churchill Cup at Twickenham in 2007. He just missed out on selection for the 2007 Rugby World Cup for England, despite spending the summer in their training camp. He was called up to the England squad for the 2008 Six Nations Championship. Many experts were calling for Cipriani to be picked at full-back to ease him into the international arena, a position he played successfully with Wasps upon breaking into the first team. His starting debut for England was due to be realised when he was picked at full-back for the game against Scotland on 8 March 2008. However, two days before Cipriani was to make his full England debut, he was axed from the squad due to "inappropriate behaviour". Cipriani was photographed leaving a London nightclub at 12.30am. He started the match against Ireland on 15 March 2008, which England won 33–10, replacing Jonny Wilkinson at fly-half. He had a successful match, converting all of his goal kicks and controlling the game well. After the match, he gave an interview for the BBC, in which he accidentally swore. 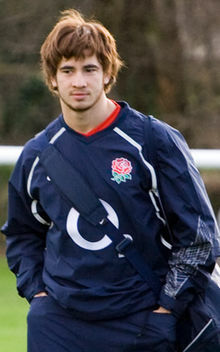 Cipriani was named in the England Saxons squad on 1 July 2008. On his return to England he scored 19 points including a try. After a long period of time in international wilderness, Cipriani was called up to the 2014 England rugby union tour of New Zealand, coming off the bench in the 1st and 3rd tests. He was named on the bench for the opening match against Wales in the 2015 6nations but failed to make an appearance. The following week, he replaced George Ford during the second half against Italy and scored a try with his second touch. England went on to win 47–17. Cipriani was subsequently left out of the final 31-man squad for the 2015 Rugby World Cup. In 2016, Cipriani was left out of new coach Eddie Jones' first elite player squad for the Six Nations. Cipriani was arrested for drink-driving after the car he was driving was involved in a collision with a taxi at 05:15 on 1 June 2015. He was convicted after a five-day trial for drink-driving before Westminster Magistrates' Court on 24 June 2016. He was ordered to pay a total of £7,620 in fines and costs and banned from driving for 18 months. On 15 August 2018, during a pre-season tour in Jersey, Cipriani was arrested after an incident at a nightclub in St Helier. He was charged with common assault, larceny, assault on police, resisting arrest and being disorderly on licensed premises later that day. Danny Cipriani is mixed-race; his father is Afro-Trinidadian with some Italian heritage while his mother is English. Cipriani's father, Jay, and his mother, Anne, separated soon after his birth. Although Jay returned to Tobago, Cipriani was able to remain in contact with him. In 2014, Cipriani posed shirtless for a PETA "Ink Not Mink" ad, showing off his tattoos on behalf of the anti-fur campaign. ^ Kelvin MacKenzie (20 March 2008). "Mum's sacrifice hatched a star". The Sun. London: News Group Newspapers. Retrieved 20 March 2008. ^ a b c McRae, Donald (8 January 2008). "I've been dying to get picked since I was so young". Guardian. London. Retrieved 6 March 2008. ^ Danny Cipriani: 2008/2009 Biography & Statistics – London Wasps Archived 14 April 2009 at the Wayback Machine. Wasps.co.uk. Retrieved on 3 May 2011. ^ "Danny Cipriani Profile". Stuart Higgins Communications. Archived from the original on 24 July 2010. Retrieved 6 October 2010. ^ "Heineken Cup final: Leicester 9–25 Wasps". BBC. 19 May 2007. Retrieved 24 August 2015. ^ Walsh, David (23 March 2008). "Interview Danny Cipriani". The Times. London. Retrieved 1 May 2010. ^ Exclusive: Kelly Brook's boyfriend Danny Cipriani knocked out by Josh Lewsey. mirror.co.uk. Retrieved on 3 May 2011. ^ Cipriani and Lewsey 'in training ground bust-up'. Inthenews.co.uk. Retrieved on 3 May 2011. ^ "Cipriani ruled out for six months". BBC News. 19 May 2008. Retrieved 1 May 2010. ^ Booth, Jenny (19 May 2008). "Danny Cipriani out for six months". The Times. London. Retrieved 1 May 2010. ^ "Wasps 23–27 Bath". BBC News. 1 October 2008. Retrieved 1 May 2010. ^ "Cipriani returns to Wasps line-up". BBC News. 30 September 2008. Retrieved 1 May 2010. ^ "England v All Blacks: Teams". Sky Sports. BSkyB. 29 November 2008. Archived from the original on 13 April 2009. Retrieved 13 May 2010. ^ "Danny Cipriani returns for Wasps after broken leg". Rugby Union. BBC. 19 February 2010. Retrieved 13 May 2010. ^ Gould, Russell (19 February 2010). "Club, not cash, lures Cipriani to Rebels". Herald Sun. News Limited. Retrieved 22 April 2010. ^ "Danny Cipriani to leave Wasps and join Melbourne Rebels". Rugby Union. BBC. 19 February 2010. Retrieved 13 May 2010. ^ "Cipriani has World Cup chance: Healey". Ninemsn. Archived from the original on 16 July 2011. Retrieved 20 April 2010. ^ Warnock, Neil (21 August 2010). "Neil Warnock: Cipriani is training with us". The Independent. London. Retrieved 21 August 2010. ^ "Cipriani trains with Rapids". Press Association. 3 September 2010. Retrieved 3 September 2010. ^ a b Paxinos, Stathi (6 October 2010). "Cipriani a no-show as Rebels step up preparations". Age. Melbourne: Fairfax. Retrieved 6 October 2010. ^ "Cipriani offered MK Dons contract". UK: Talk Sport. 28 September 2010. Archived from the original on 3 October 2010. Retrieved 28 September 2010. ^ AAP (13 November 2010). "Cipriani finally ready to Rebel". Australian Rugby Union. Archived from the original on 22 February 2016. Retrieved 13 November 2010. ^ Schlink, Leo (5 October 2010). "Major Melbourne Rebels sponsorship in bank". Herald Sun. News Limited. Retrieved 6 October 2010. ^ Todd, Ben (22 January 2011). "Danny Cipriani holds on to dream of England recall after beating his demons". Mail. London: Associated Newspapers. Retrieved 23 January 2011. ^ Wyatt, Ed (18 January 2011). "A night to remember". Melbourne Rebels. Retrieved 27 January 2011. ^ "Rebels it make it two from two". Melbourne Rebels Website. 21 January 2011. Retrieved 27 January 2011. ^ "Danny Cipriani". Official Melbourne Rebels player profiles. Retrieved 8 May 2011. ^ Paxinos, Stathi; Growden, Greg (4 May 2011). "Cipriani in strife over night out". Sydney Morning Herald. Fairfax. Retrieved 9 May 2011. ^ "Cipriani out of Rebels' tour". ABC. 4 May 2011. Retrieved 9 May 2011. ^ Smith, Wayne (26 April 2011). "Danny Cipriani's defence is a real concern for Melbourne coach Rod Macqueen". The Australian. ^ Mairs, Gavin (22 February 2012). "Danny Cipriani signs three-year deal with Sale Sharks in hope of reviving England career". The Daily Telegraph. London. ^ "Danny Cipriani: Sale Sharks fly-half agrees return to Wasps". BBC Sport. 16 February 2016. ^ "Danny Cipriani to join Gloucester next season to help England career". BBC Sport. 14 May 2018. Retrieved 20 May 2018. ^ "Tindall & Hodgson miss World Cup". BBC. 13 August 2007. Retrieved 2 September 2015. ^ "Vainikolo named in England squad". BBC. 9 January 2008. Retrieved 9 January 2008. ^ "England to Fast Track Vainikolo". Sportinglife. 9 January 2008. Archived from the original on 5 June 2011. Retrieved 9 January 2008. ^ "Cipriani joins England training". BBC. 2 October 2007. Retrieved 9 January 2008. ^ "Cipriani warms to full-back role". BBC. 5 March 2008. Retrieved 6 March 2008. ^ "Cipriani axed from England team". BBC. 6 March 2008. Retrieved 16 October 2010. ^ Cary, Tom (1 April 2011). "Danny Cipriani desperate to impress Martin Johnson to earn England recall". London: The Telegraph. ^ "Cipriani takes Wilkinson's place". BBC. 11 March 2008. Retrieved 11 March 2008. ^ "England rugby star Danny Cipriani in F-word blunder seen by millions on live TV". Daily Mail. London. 20 March 2008. ^ "Eddie Jones: 'Danny Cipriani is in the England picture' despite Six Nations 2016 axe". Retrieved 11 July 2016. ^ "Judgement by Howard Riddle, Chief Magistrate of England & Wales" (PDF). judiciary.gov.uk. 24 June 2016. ^ "Danny Cipriani guilty of drinking and driving". bbc.co.uk. 24 June 2016. ^ "Danny Cipriani charged with nightclub assault". bbc.co.uk. 15 August 2018. ^ "Cipriani's off night proves costly but coach's ambition may yet save him". Guardian. 15 August 2018. Retrieved 17 August 2018. ^ Glover, Tim (5 March 2008). "Rise of a Red Rose shooting star: Cipriani seizes his moment". The Independent. Retrieved 26 October 2014. ^ "Danny Cipriani Strips Off For PETA," Huffington Post United Kingdom, 2 January 2013. This page was last edited on 16 April 2019, at 19:54 (UTC).